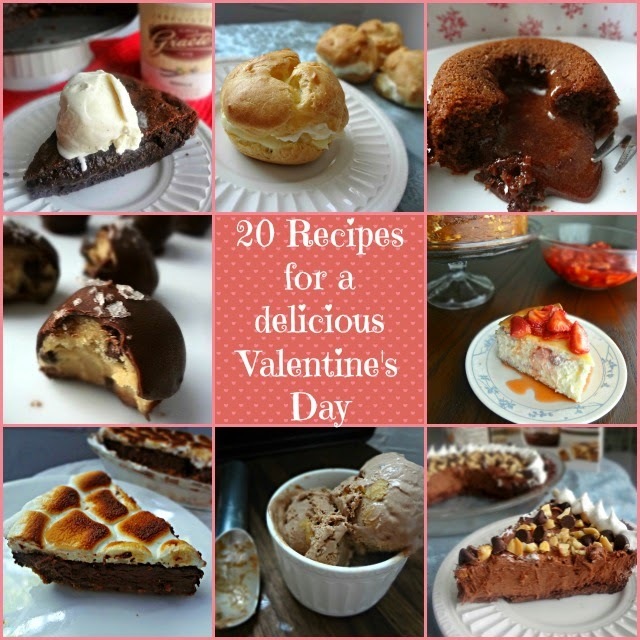 Ok so for the fourth year in a row I'm posting a round up of Valentine's Day recipes. I just...I love love. Red is my favorite color. Hearts are my favorite shape. And roses are my favorite flower. So this is kind of my holiday. Even though I never do much for it, that's ok. I like the spirit of the day! And it is going to be here in just over a week! eeee! This year's round up is made up of only the BEST of the best dessert recipes that I have accumulated that I feel will work best for Valentine's Day! And...obviously...there's a lot of chocolate. You're welcome. Super gooey and rich-this cake will impress any loved one and make both your mouths water! To date this is my favorite flourless chocolate cake/torte recipe. It is unbelievably silky and decadent and indulgent! Cream puffs just seem fancy and sophisticated. And if you get some whipped cream on your face-perfect excuse for someone else to kiss it off! A super simple chocolate mousse, this chantilly is light and individually portioned, so you won't feel too full! Just chocolatey yumminess. Best served with ice cream! This sweet treat is best served for 2! Dig in and enjoy the nostalgia of childhood with the s'mores flavors and then go "mmm" because it tastes sooo good! Feed each other these truffles. Trust me. THESE TRUFFLES. Serve them to anyone and I'll be surprised if they don't propose. Michael and I were both obsessed with just how good these cookie dough truffles are-super high quality and irresistible! Ooooh la la-this cheesecake is so luscious and perfect. S'mores pie...I mean...come on. Need I say more? This ice cream is amazing on its own or served with one of the other recipes on this list! Such a great (non-ice cream maker and crazy easy) ice cream recipe. It is just delicious. This is one of Michael's favorite desserts that I've ever made him-it straddles the line between being refreshing and sweet and indulgent. It's essentially a pie made of peanut butter caramel. It's just yummy. I miss this pie. It's just sinful! Another Michael fave! This pie is pretty and tasty and...I mean...chocolate + peanut butter. Need I say more? This pie is straight up addictive. Like lurrrrrve.